« Day 1 – We’re Off! I never slept well the first few nights while on business travel. The unfamiliarity of the room and bed just didn’t feel right. Last night was an interesting experience. Our small room had 3 bunk beds and a single bed. A man from France, a couple from Denmark, a woman from Germany and the Americans from Colorado. The snoring started before I fell asleep. Good thing I’m easy going because it was comical to me. One man sounded like he was “sawing logs” while a woman was breathing very loudly. With the lights out one cannot tell who was making all the sounds. There are not accents to snoring. We all sound the same. It took me awhile to fall asleep. I was exhausted! No need to set an alarm unless you want a really early start. By 0615 people were stirring and packing their gear and backpacks for the day’s walk. This was a considerate group in that everyone was moving about as silently as possible so as not to disturb those still sleeping. I got up and did the same. Breakfast was being served downstairs at 0630. In the Alberque, dinner and breakfast is served community style so everyone eats together. It was nearly 7am and I went back upstairs to check on Nancy and Andrea to see how they were doing. There were cuddling on Nancy’s single bed. They didn’t want to get up! Uh oh! This is only our second day and they didn’t want to move!!! Of course, they started getting ready soon after. We left the little village of Rabe at 0750 this morning. We soon started climbing up hill then entered the “breadbasket of Spain”, La Meseta. With all the rain, there was lush green fields as far as the eye could see. I hear it’s going to be this way for a few days. We entered one of the very early villages that sprung up along the Camino to support the pilgrims, Hornillos del Camino. This village has less than 100 people. We stopped there at the town center by the Gothic Church of San Roman in the Plaza de la Iglesia. It was 1000 and we were famished. We had cafe con leche (what else!) and a bocadilla which is a large serrano ham and cheese sandwich on fresh baked crusty bread. Perfect! While sitting outside on the Plaza we joined a few fellow Pilgrims we shared the Alberque with the night before. A German woman, 3 Aussies, a Welshman, and a few Spaniards. There were two Guardia Civil officers at the Plaza stopping for a quick bite. 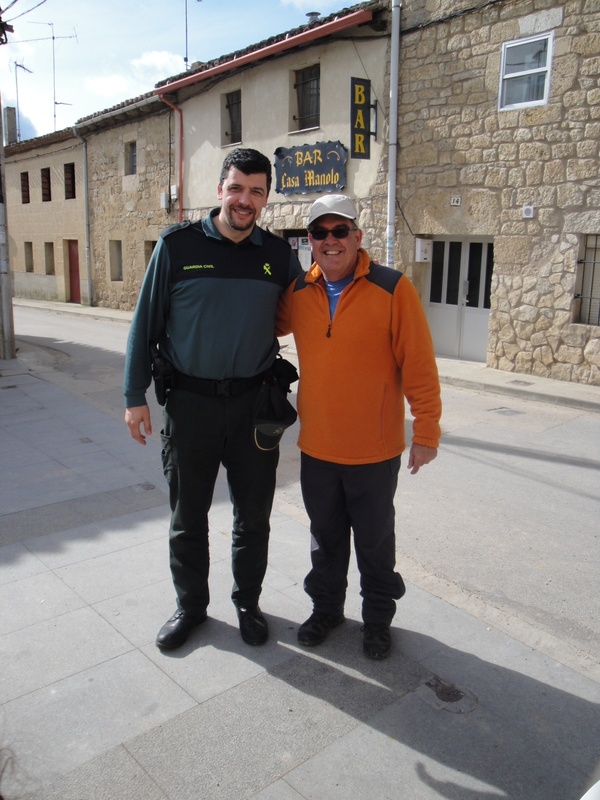 I started a conversation with them (no surprise to you) and before you knew it, Nancy was taking a picture of me with the senior Guardia Civil. From Hornillos we continued our walk on the Meseta. What lovely expansive views of rolling hills and flatlands all green with birds everywhere singing and chirping. That’s all one can see in any direction. 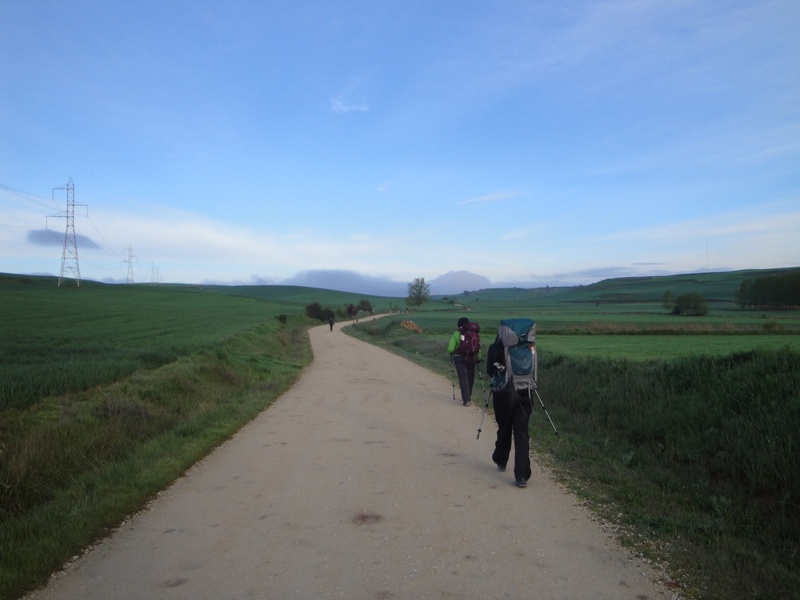 I had a long chat with three Spanish men walking the Camino. My spanish speaking and comprehension continues to improve daily. I practice it every chance I get. It’s a welcome relief for the Spaniards to find foreign Pilgrims able to speak passable Spanish. We reached our goal of Hontanas today at 1320 in the afternoon! We covered 18.5 kilometers today in 4.5 hours. That’s not breaking any speed records but that includes all the stops for taking photos, rest stops and one stop at the cafe for cafe con leche and bocadilllas. We walked 13.3 kilometers our first day in 3.5 hours. We did a little more today. We’re trying to build a walking legs gradually. We’ve heard enough horror stories in just two days of walking from fellow pilgrims who have started in France to know that we don’t want to become one of the casualties. The idea for us is to reach Santiago de Campostela with good experiences to share. However, I’ll “keep it real.” It’s not easy what weve done so far. My right ankle and foot, right hip and lower back are already starting to talk to me. Nancy’s right knee continues to bother her and at times, she’s walking in pain. Andrea’s hips started bothering her today as well. We’re hoping to find our own pace and get to a place to stay for the night by 1330 in the afternoon. We’ll see how well this strategy works. 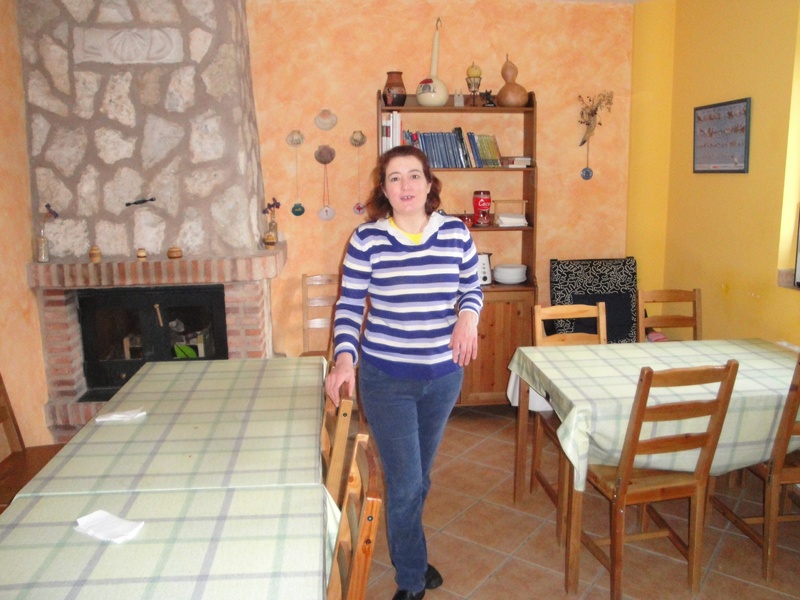 We have registered at the private Alberque “El Puntido” opposite the parish church oof the Conception. It’s a beautiful 14th century church which towers over this very tiny villlage of 80 people. We are in a room with 5 comfortable bunkbeds and a single bed, tile flloors, very clean. By chance, we’re bunking with the Spanish men I spoke to earlier today, a German lady, Heike, who we bunked with last night, a gentlemman from the Isle of Man Nancvy walked with earlier today and a young Spanish couple. The Camino is an amazing experience and opportunity to meet with people from all over the world. It’s now 1600 in the afternoon. We’ve all bathed, our clothes are washed, I’ve blogged for the day and there’s a cold beer or two or three waiting for me downstairs! 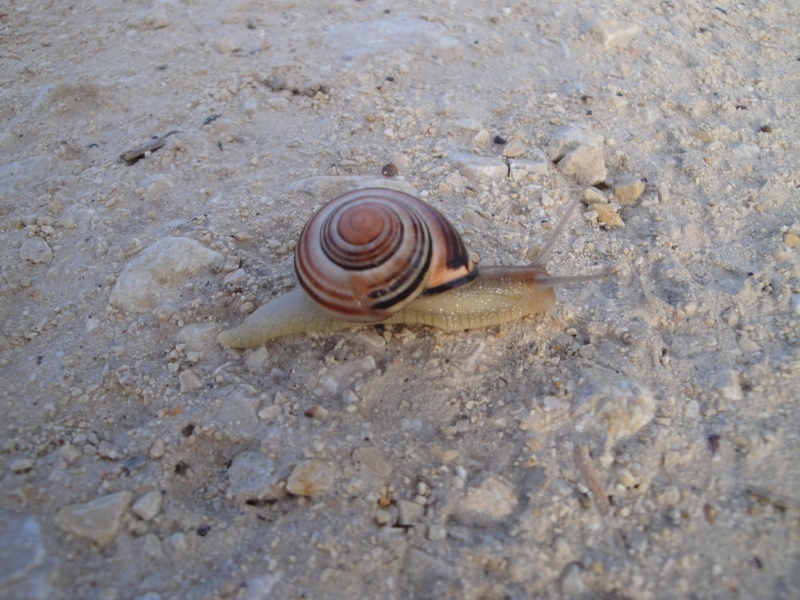 This is about how fast we’re moving on the Camino! 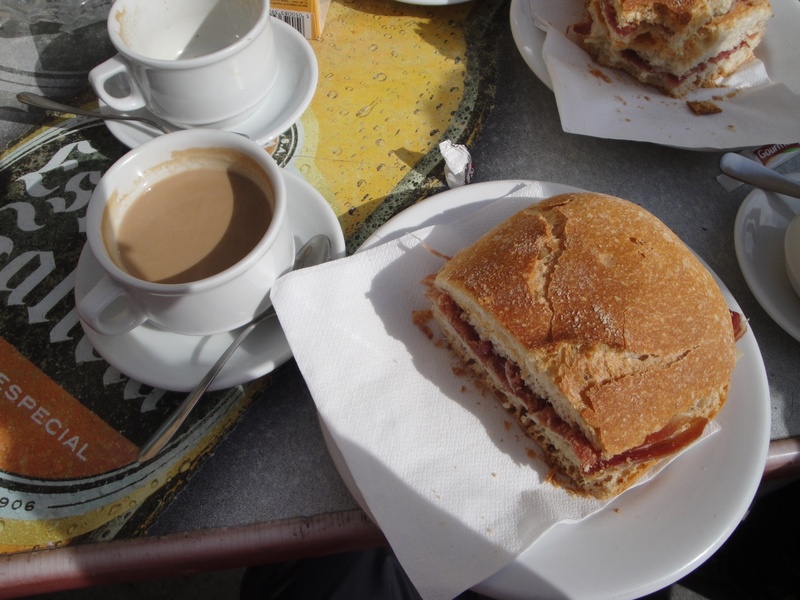 Lunch in Hornillos, cafe con leche and a bocadillo. Sounds wonderful, Joe. Glad to hear you are off to such a good start and trying not to push too hard too soon. May God grant you the chance to feel His presence more fully and hear His voice more clearly on your pilgrimage. Met someone from the isle of man. Thats a awesome place ask about when the towns all get ready for the big motorcycle rwce they have there. Mr . Gomez to funny theres no accents in snoring. Bout fell over laughing. I didnt reslise that all the pilgrims stay in the rooms like that have to say definitely a culture shock in many ways bit learning from each and what there backgrounds are like and to hear some great stories along the way. What a venture. You guys can do it get in that strive and nothing will slow you down. Sending many comforting prayers for you guys.